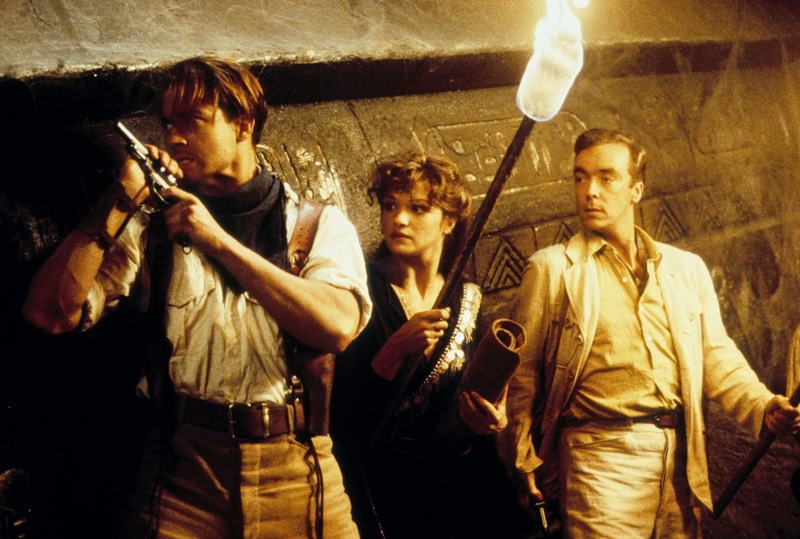 A rollicking adventure in the style of Raiders Of The Lost Ark, The Mummy ditches any serious pretenses and just focuses on delivering large doses of mindless fun. In ancient Egypt, High Priest Imhotep (Arnold Vosloo) commits the ultimate betrayal by falling in love with Ankh-sun-Namun (Patricia Velásquez), who belongs solely to the Pharaoh. When the sin is revealed, Namun commits suicide, while Imhotep receives the worst possible fate: he is mummified alive and entombed with flesh eating bugs. They are buried in Hamunaptra, the city of the dead. Imhotep has the powers to dominate the world and resurrect his lover, if he himself is revived with readings from the book of the dead. In the mid 1920s, adventurer Rick O'Connell (Brendan Fraser) is part of garrison that stumbles onto the ruins of the now lost city of Hamunaptra, where he is abandoned in battle by the coward Beni (Kevin J. O'Connor). Back in Cairo, spunky librarian and amateur Egyptologist Evelyn (Rachel Weisz) is clumsy enough to wreck a library room, much to the disgust of head librarian Dr Terrence Bay (Erick Avari). Evelyn saves Rick from hanging, and they team up with Evelyn's brother Jonathan (John Hannah) and go in search of the treasures of Hamunaptra. But they are not alone: Beni is leading another expedition to the same city, while a tribe of warriors under the leadership of Ardeth Bay (Oded Fehr) is entrusted with ensuring that no-one revives the mummy. Rick: Is he supposed to look like that? The Mummy hints at, rather than fleshes out, anything that may get into the way of the non-stop action. The characters of O'Connell, Evelyn and Jonathan are barely provided with any sort of a backstory. O'Connell is the American adventurer, Evelyn the clumsy librarian, and Jonathan the haughty Brit abroad, and that's all that the script, by director Stephen Sommers, is willing to offer. And in Brendan Fraser, Rachel Weisz (in 1999) and John Hannah, the film is not exactly radiating with star power. As for the story, it matters even less. A pre-credit sequence introduces Imhotep, his lover Ankh-sun-Namun, and their miserable fate, but that's where the history and science end. Sommers is keen to get to the ancient flesh-eating bugs, the reanimated mummies, and all sorts of dead rising to rumble, leaving the whys, wherefores, and what-abouts for other movies to ponder. Beni: Think of my children! Rick: You don't have any children. Beni: ... Some day I might. What The Mummy lacks in star talent, charisma, and story depth, it makes up for in pure effort, a steady stream of sharp humour, and good special effects. There are some excellent one-liners and dialogue exchanges, and the action scenes are delivered with joyful bombast. The Mummy generates a strong, uninterrupted current of kinetic energy, the reservoir of suspended disbelief put to good use in powering two hours of tongue-in-cheek shoot-outs, sword fights, chases, dark magic throughout Egypt, and the obligatory romance-with-rough-beginnings between Evelyn and Rick. The special effects are enjoyable for the era, the revived mummy suitably disgusting, the flesh eating insects yucky, and Imhotep's army of skeletal guards funny in the most rickety way. Dr. Bey: We are part of an ancient secret society. For over three thousand years we have guarded the City of the Dead. We are sworn at manhood to do any and all in our power to stop the High Priest Imhotep from being reborn into this world. Ardeth Bay: Now, because of you, we have failed. Evelyn: And you think this justifies the killing of innocent people? Ardeth Bay, Dr. Bey: YES! Fraser dives into the role of Rick O'Connell with no hesitation, all-in to create a more robust, less intellectual Indiana Jones-type character. Weisz struggles a bit to find a line on the resourceful yet clumsy librarian who turns into a desert adventuress, Evelyn written more as a mish-mash from other characters without a defining quality of her own. John Hannah has plenty of fun as Jonathan, and gets to play the role of romance observer, in over his head when it comes to violence but helpful in spite of himself. Lacking a sharp brain but otherwise full of vigour, The Mummy unwraps dollops of amusing silliness.